This fruit is banned in most public buildings and hotels! 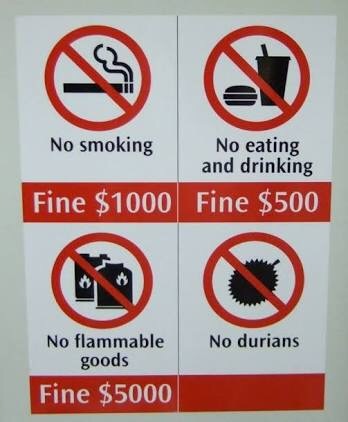 Durian is infamous for its pungent revolting odour, which when cut into can fill a house within minutes. Even with the spiky husk intact this fruit can be smelled from yards away! A large stack of durians like the one below will smell awfully similar to a garbage dump/land fill with a hint of sweetness on a hot day from a distance. Me personally, i would compare the smell to a rotting honeydew melon mixed with methane gas in a hot bin liner. 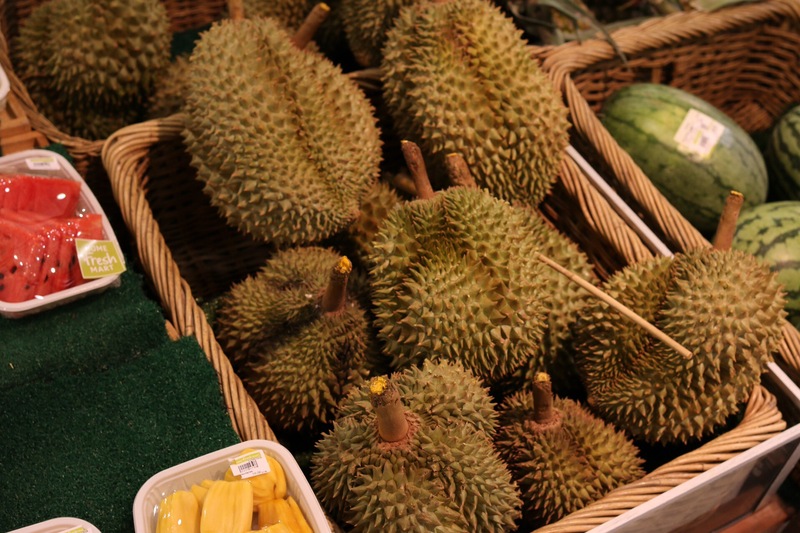 Durian is loved by those who can overcome the smell. 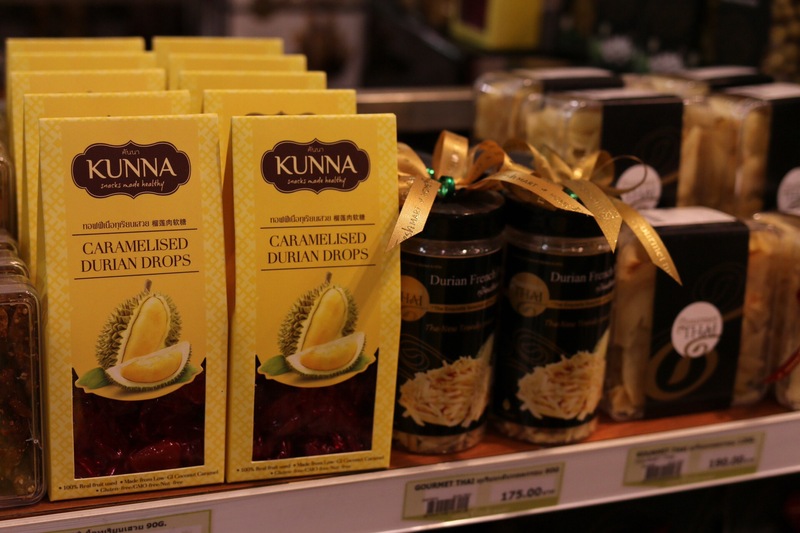 It is a versatile fruit which can be made into a number of products. sweet desserts, smoothies, ice cream and cakes are just a few which i have seen. 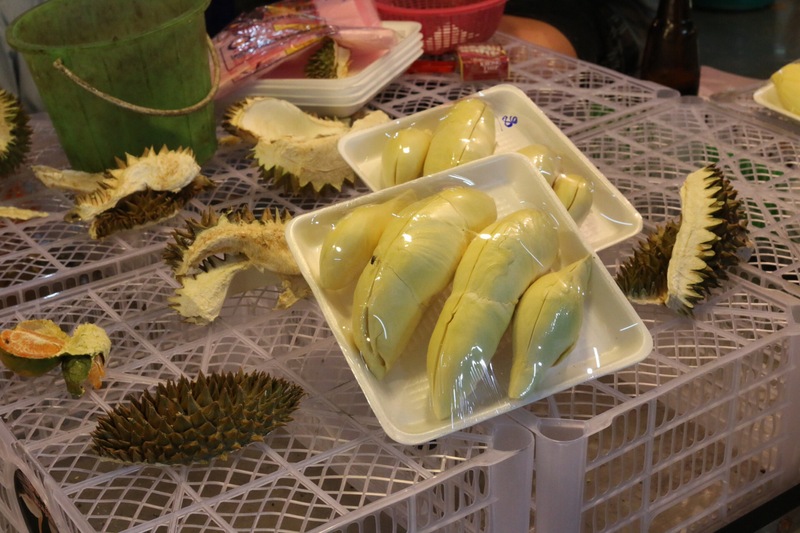 In the quest to get more facebook likes, website hits and to give this thread some legitimacy, I decided to adopt a mind over matter aproach and finally eat some durian. My first impressions… Its supprisingly quite pleasent!! The texture is a bit bananaery in the sense that is turns creamy and custardy when chewed. The flavour is like sweet almonds with very ripe melon, hints of savoury chives, custard apple and garlic. Sounds gross but it works quite well, so much so that i actually enjoyed eating it. I had a few large pieces and almost forgot about the smell. Would i eat it again? Yes! Most definately, but id probably enjoy it more sat outside on a windy day, or inside with a peg on my nose!